Henry Louis Gates Jr.'s arrest most certainly was a "teachable moment" in the racial conversation--but we've learned nothing. Official White House Photo by Pete Souza President Obama, Professor Henry Louis Gates Jr. and Sgt. James Crowley in the Rose Garden, July 30, 2009. Taxi drivers provide a perverse service to the racial conversation when they refuse to pick up black people. Clearly it would be better if they stopped, so that we wouldn’t be left hailing the night air like fools or relying on white friends to sneak one past the censor like supplicants. But if anyone is going to experience racial hardship, let it be the cab riders. For if you can afford to take a cab, then it is probably not a bad thing to be reminded that racism brooks no exceptions–up to and including the ability to pay. Racism discriminates against people on the grounds of race. Just like it says on the packet. It can be as arbitrary in its choice of victim as it is systemic in its execution. And while it never works alone (but rather in cahoots with class, gender and a host of other rogue characters), it has political license to operate independently. It’s a basic lesson at relatively low cost. And yet the arrest of Harvard professor Henry Louis Gates Jr. at his home in Cambridge, Massachusetts, suggests we are doomed to keep repeating the lesson. Barack Obama was right when he referred to the arrest as a “teachable moment,” but given the brouhaha that has followed, it seems that even a moment involving the nation’s most prominent black intellectual teaches us nothing. This lesson should come in two parts. First, all such tales attempt to stage racism as a crude morality play, with individuals as absolute victims and absolute villains, rather than as a system of oppression that works primarily through institutions. The victim must have no priors and no drugs. And unless the perpetrator is photographed with a billy club in hand and uses racial slurs that are recorded on tape, we are supposed to give him the benefit of the doubt. For an individual, that is fair. For a system, it is farcical. While it may be intriguing to speculate about what two people may or may not have been thinking, feeling and intending at any given moment, the proof of racism is in the odds. Black people in America fall foul of not just the law of the land but the law of probabilities as well. They are more likely to be stopped, searched, arrested, convicted and executed. A ridiculous black man and a ridiculous white man do not stand the same chances when put before a man with a badge, gun or gavel. The figures bear this out, and at the end of the day, nooses and burning crosses shouldn’t be necessary to demonstrate racism’s reach. Which brings us back to Obama, who first said the Cambridge police acted “stupidly,” only to then “recalibrate” his remarks before inviting the arresting officer, James Crowley, and Gates to the White House for beers and reconciliation. This was primarily remarkable because, for reasons both pragmatic and strategic, Obama’s interventions in matters of race are so very rare. So it is curious that he would use the considerable influence he has in this area to defend a tenured Harvard professor who was detained for a few hours. Indeed, the only other public pronouncement Obama has made about race since his election was delivered just a week before Gates’s arrest, at the NAACP conference. On the organization’s centenary he paid homage to the civil rights movement and, recognizing the inequalities bequeathed by segregation, he started talking about parenting. These two interventions feel like the Talented Tenth circling the wagons. There are a huge number of explanations for black underachievement in this country, none of which are merely “excuses.” But Gates’s experience also gave the lie to Obama’s exhortations. Gates got good grades, probably never cut school and does not live amid crime and gangs. If he had, the incident might have ended up in anything from a police record to his death while never even making the local paper. Not that Gates didn’t have a legitimate grievance. But he probably could have handled the matter without the help of the commander in chief. The same cannot be said for, say, Troy Davis, who sits on death row in Georgia for the murder of an off-duty police officer, which he insists he did not commit. Seven of the nine witnesses who identified Davis have recanted or contradicted their original testimony, which they claim was made under police coercion. One of the remaining two is also a suspect in the crime. Desmond Tutu, the pope and Jimmy Carter (all conspicuously silent on the Gates saga) have called for a new trial or evidentiary hearing. This is a matter where Obama’s involvement could tip the balance between life and death. As I write, the beers are in the presidential fridge. 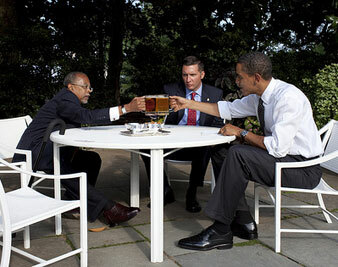 After their drink, Gates will go back to Harvard, Crowley will return to the force, Obama will stay in the White House. Nothing about law or race, not even the national conversation, will have changed. And Troy Davis will remain on death row. For now the only beer he can expect will be with his last meal. And he will be drinking alone. Gary YoungeTwitterGary Younge is a columnist for The Nation.